With so many shopping opportunities to try, you’re bound to find something special to take home have a lingering impression about Indonesia. Indonesia’s textile tradition is simply limitless. For Indonesians, fine textiles are more than just a piece of cloth. They carry symbolic meanings and are inseparable from social and religious rituals that are intertwined with the lives of its people. The traditional cloth is beautiful batiks of Java, the highly intricate ikat weaving traditions of eastern Indonesia, and the songket of Sumatra. Batik is an integral part of Javanese culture. A highly developed art tradition with origins in the royal courts of Java, batik has since become a national identity embraced by all Indonesians regardless their ethnic origin. Many regions in Indonesia such as Kalimantan, Jambi (Sumatra), and Bali also have Batik Traditions. On October 2, 2009, Batik was acknowledged as Masterpiece of the Oral and Intangible Cultural Heritage of Humanity from Indonesia by UNESCO. Batik galleries are wonderful places to get a more intimate knowledge of this beautiful cloth and style yourself up with a cultural touch. However, if you’re in adventurous mood, roam around bustling traditional batik markets in Yogyakarta and Solo for a great batik bargains. Drop by a private batik gallery and chat with the designers for an in depth explanation on the philosophy of each patterns or even a short courses in batik painting. Generally, there ara two types of batik. 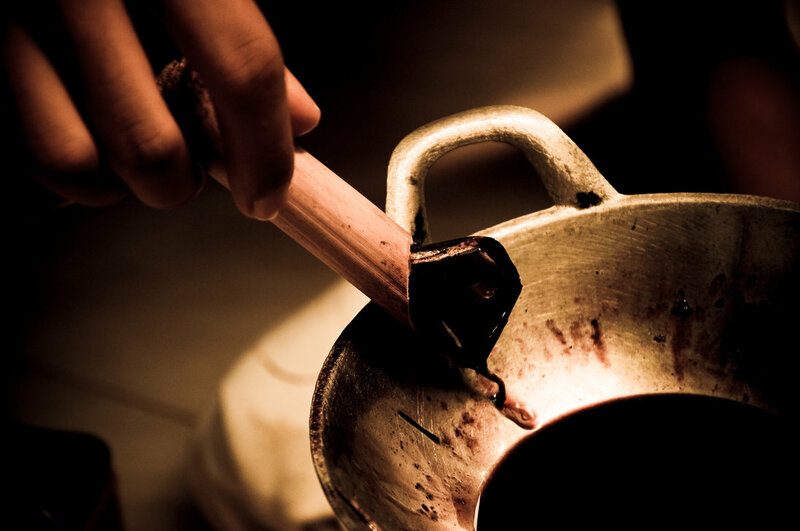 The hand-drawn/painted batik (batik tulis) uses the wax-resistant dyeing process, a tedious method of drawing patterns and designing, as well as the application of wax. The process is time consuming, requiring up to 2-3 months per cloth. Batik tulis is reversible. Stamped batik (batik cap) is an innovative method of creating batik patterns using copper blocks that already have a desired patterns. The process only takes 2-3 days per fabric. Batik is generally grouped into two main grups, namely coastal batik from the north coast of Java and the Court Batik. 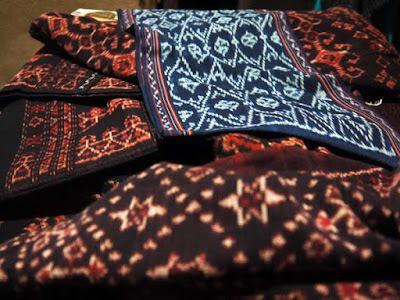 Batiks from north coast of Java (Pekalongan, Cirebon, Lasem) have long been exposed to foreign influences. Their designs incorporate Chinese, Indian and Arab, such as flower and cloud motifs. The color tend to be more varied and bright, in yellow, ochre, pinks, mauve, and blue. Cirebon’s batik is characterized by the stylized cloud motif, the megamendung. Court Batik is primarily from Solo and Yogyakarta. The colors of the batik are traditionally colored blue to symbolize eart, brown to symbolize fire, and white to symbolized water and air. Traditionally Yogya motifs are dominated with the soga (chocolate brown) and dark blue against a while background. In Yogyakarta its worth visiting Pasar Bringharjo (Bringharjo Market) for great purchase in batik and traditional crafts. 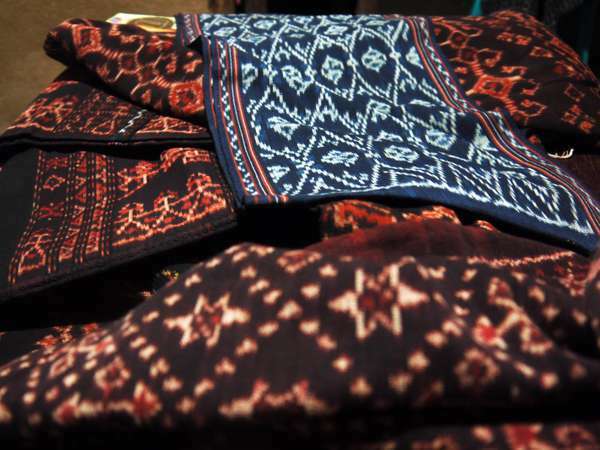 Apart from boutiques of the big name in batik, Batik Keris and Danar Hadi, Solo’s Pasar Klewer (Klewer Market) textile market has a bewildering array of batik. Another district batik motif belongs to the Madura region. Batik from this region is dominated by reds and brown hues and mushrooms motifs, which said to be associated with the brave, outspoken and hard working character of the Maduranese. 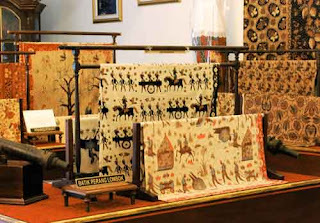 Madura's most well-known center of batik is located on Pekandangan Barat Village, 6 km outside Sumenep. 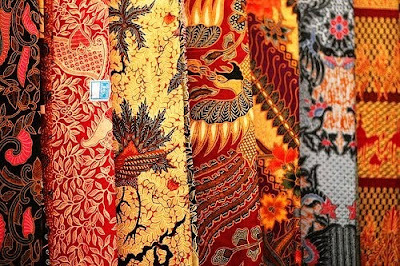 Elsewhere in the archipelago, Palembang and Jambi also produce good quality of Batik as well as Bali and Banjar at South Kalimantan. Batik motif in Palembang and Jambi are mostly dominated by local court styles. Tampuk Manggis, in the heart of Jambi city is the region's Batik center. Where to find Batik in Jakarta? 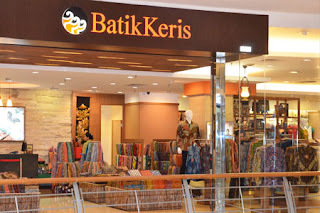 Many major Batik companies from Central Java like Batik Keris, Danar Hadi, and Batik Semar have outlets in Jakarta, such as in at Plaza Indonesia, Sarinah on Jl. MH Tamrin, Pasaraya Grande, Blok M Plaza in Blok M, South Jakarta, Mall Taman Anggrek, Kepala Gading Mall and Puri Indah Mall in West Jakarta. They offer a variety of items made from batik, from blankets, cushions, tablecloths, curtains and paintings to bags and thongs. The name of ikat is taken from an Indonesian word literally translated as "to bind". The process involves binding the resist material at intervals around the yarn. 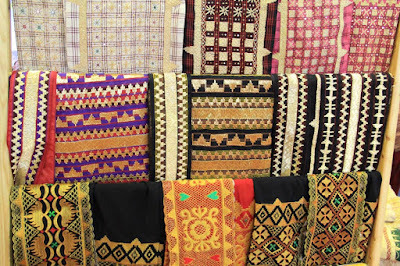 There are three methods of tenun ikat. They are warp ikat, weft ikat and the rare double-ikat. 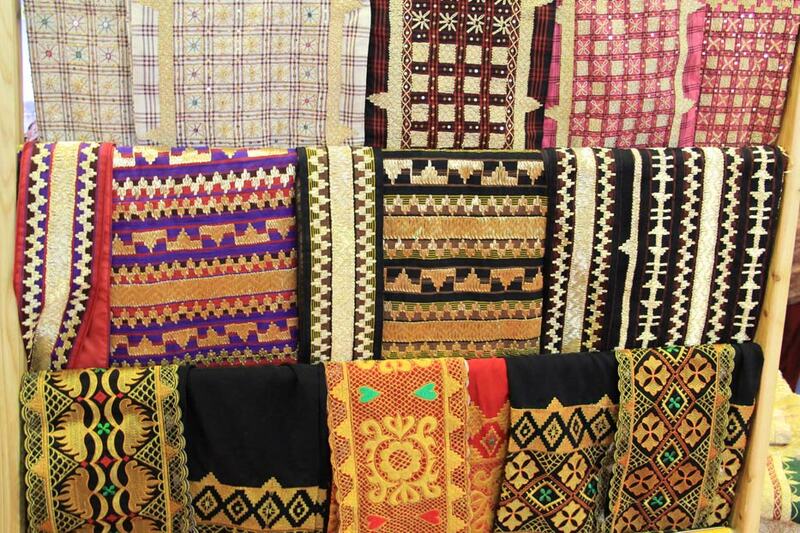 The Batak in North Sumatra, the Toraja in South Sulawesi, in Lombok and the islands in the eastern part of Indonesia, namely Sumba, Flores, Sawu and Bima are producers of great quality and exquisitely designed ikats. In Bali, the double-ikat gringsing cloth is considered the most sacred of all textiles and is used in many important ceremonies. Gringsing can be found in Tenganan village and Merumas, Jalan Astina Utara Gianyar, Bali. Songket is synonymous with Sumatra, found in West Sumatra, Aceh and Riau. In Palembang, beautiful songket can be found in Jalan Ki Gede Ingsuro, Palembang, South Sumatra. Traditional West Sumatra songket is ornately brocaded with gold and silver threads. Major centers include Koto Gadang, Padang Panjang, Payakumbuh and Silungkang. You will have the opportunity to see weavers at work at Pandai Sikek (Sikek literally means weavers), a village 12 km south of Bukittinggi. 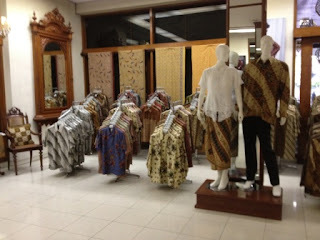 1 Response to "Shopping Indonesia -- Exquisite Cloths and Textiles"